The Oxford vs Cambridge Boat Race may be a quintessentially British sporting event, but it brings worldwide attention to a couple of boats on the River Thames for one Sunday every year. Now it's back for another head-to-head between the two universities for 2019 and we'll make sure you're in the driving (or should that be rowing?) seat to stream Boat Race live coverage online regardless of where you are. 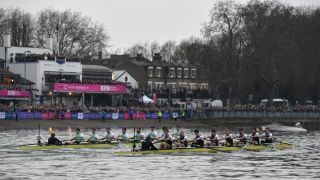 The 2019 Oxford versus Cambridge Boat Race will take place on the River Thames between Putney and Mortlake in London on Sunday, April 7. There are two races, one for women and one for men, each lasting around 20 minutes. The Women's Boat Race will start at 2.15pm BST while the Men's Boat Race will begin at 3.15pm BST. The waters of the river Thames in London will once again see which university team has the rowing ability to take the title of varsity Boat Race winner. The rowing race takes place on a length of London's river Thames between Putney and Mortake. Last year saw 'Light Blues' Cambridge win both the men's and women's races against the 'Dark Blues' Oxford, the former by three lengths in a time of 17:51 and the latter by seven lengths in 19:06. Cambridge currently leads the overall event, which started in 1829, taking 83 victories over Oxford's 80. That excludes the 1877 race that ended as a dead heat, though those cheeky Dark Blues claimed it as a victory. While the Thames will be filled with rowing fans (as well as fans of standing-outside-pubs-on-the-river) you might want to catch it all from the comfort of home. Thankfully, that's an option. This year the races will all take place on the same day and you'll be able to watch the Boat Race live coverage on the good old BBC. If you're not in the UK then you might not be able to access the live stream. but this guide can help thanks to a few best VPN related tips and tricks. If you’re in the UK and you have a TV license, then the BBC will be broadcasting the 2019 Oxford vs Cambridge Boat Race free-to-air. That means you can catch the race on your TV by turning over the BBC One in time for the Boat Race coverage to kick off from 1.20pm BST. If you prefer to watch the event on your computer, smart TV or mobile device you can stream it on the BBC Sport website or via the BBC iPlayer app. We also heartily recommend TVPlayer.com, as a robust, legal streaming service that has all the Freeview channels in one place. If you happen to be away from the UK don’t worry as you can watch the 2019 Oxford vs Cambridge Boat Race from anywhere in the world rather simply. Simply open the VPN app, hit 'choose location' and select the appropriate location - it's super easy to do. For example, choose UK to stream the 2019 Oxford vs Cambridge Boat Race as if you were back at home in the UK. The service is free and the best legal way to stream all of the coverage at this year's Oxford vs Cambridge Boat Race live.